Boulder sinks are one of the most distinct pieces that can be added to a home. Each has its own unique artisan look. No two sinks are the same, just as no two boulders are the same. The extensive possibilities for styles, colors and textures ensure your boulder sink will fit perfectly into your home. We have compiled 4 of those styles for you to make the decision a bit easier. Adding a distinctive polished rim to a boulder sink gives the appearance of a traditional vessel sink without compromising the naturally unique look. A rimmed sink brings elegance along with the originality that every boulder sink has. An unrimmed boulder sink has a more natural aesthetic than a rimmed sink. There typically is a sharp contrast between the rough weathered rock exterior and the polished bowl inside, creating a true wow factor. A boulder pedestal sink switches up the typical vessel and vanity style in favor of a unique monolithic all-stone pairing. This style of sink is for those who want to take a bold step outside what is typical to really add grandeur to their home. Every natural boulder sink is different, as each boulder differs from the others. That being said, there are several different shapes available including a traditional sink shape, round, square or triangular. Boulder sinks are also available in sizes ranging from a small bathroom sinks to larger single- and double-basin kitchen sinks. With their one-of-a-kind look, natural boulder sinks are the perfect addition for any homeowner looking to make a statement. 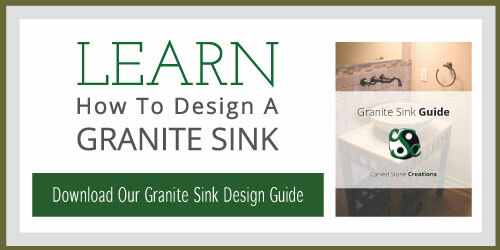 To see more examples of boulder sinks, check out our ideas gallery.